At Blossom Hill Glass, we create more than just a mirror – we create style,	beauty, and panache – all while using top-quality products and offering	unparalleled customer service. In the wardrobe area, achieving the perfect	look can only be accomplished with the use of a tailored mirror arrangement	designed to perfectly capture all angles before heading out. 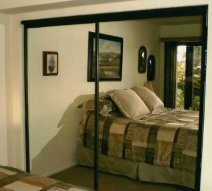 Our team of	San Jose glass experts will work closely with you to help you craft that special and unique mirror	for your wardrobe or wall. Design your perfect mirror today – call for a free price quote! For custom wardrobe and wall mirrors in the San Jose and Silicon Valley,	please contact our office immediately. We have 25 years’ experience	in custom glass projects, and we offer	free estimates on the total cost of service. To reach us,	call (408) 629-7500	today.